Gulf Savannah Region is around the Gulf of Carpentaria. Gulf Savannah Region is a large area of savannah grasslands, open woodlands and melaleuca swamps in north western Queensland. Its northern parts are covered in mangroves and tidal creeks inhabited by crocodiles, and known for Karumba, Normanton and Burketown. 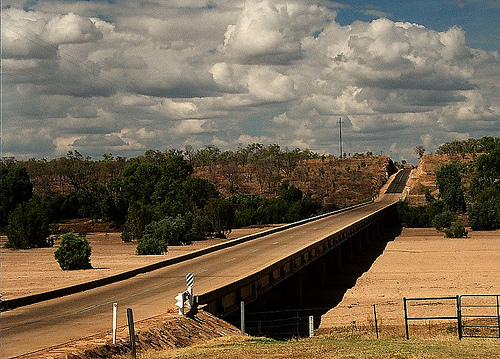 In the western parts are some outback national parks like Lawn Hill Gorge and the world famous Riversleigh Fossil Field. In the south east are some gemfields around Croydon, Georgetown, Forsayth and Einasleigh. There are also the famous Undara Lava Tubes, Gobbold Gorge, and some history of Australian explorers such as Burke and Wills expedition. The road from Innisfail on the coast takes you first past Millaa Millaa and Ravenshoe in the southern Atherton Tablelands, then Innot Hot Springs and the mining town Mt Garnet, past Fourty Mile Scrub National Park to Lynd Junction - the roadhouse that is known for the smallest bar in Queensland. South from here, the Gregory Developmental Road goes past Greenvale and Bluewater Springs Roadhouse to Charters Towers. Greenvale is a tiny town that has the pub that Slim Dusty sang about in his song "Three Rivers Hotel". There is a caravan park in town. If you turn west in the Lynd Junction, you first come to the famous Undara Lava Tubes, left behind by a shield volcano that erupted here 190,000 years ago. In the eruption that lasted for three months, the outer layers of the huge lava flows cooled and froze into a crust. 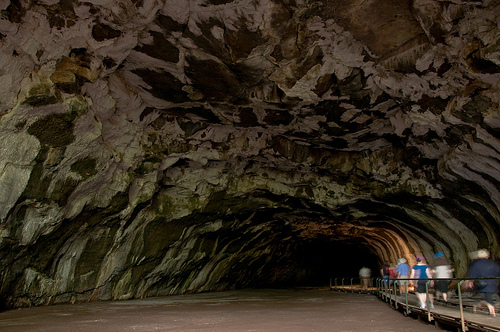 The hot lava kept flowing inside the tubes, and finally left behind the huge hollow basalt chambers. You can visit them on tours that depart from the restaurant, accommodation and camping ground. Back on the main road, the next town west is Georgetown. It used to be a busy town but today it’s just a quiet little place in the middle of gem fields. The town's tourist attraction is the Ted Elliott Mineral Collection in The Terrestrial – a huge collection of colourful gemstones from all around the world, very beautiful, and interesting. If you happen to stay over night, there is a pub with hotel rooms, Latara Resort Motel, and Midway Caravan Park. 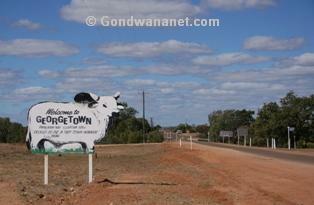 West from Georgetown is Croydon - once a large gold mining town with more than 30 pubs and 5000 mines around it. A historic Courthouse, a jail and an old school are still here, as well as a few old miners cottages, a Chinese Temple site, the “Oldest Store in OZ”, the Town Hall and the modern train station. Gulflander shuttles once-weekly between here and Normanton; and you can stay at the Club Hotel, which is the town’s pub, or the Golden Caravan Park. North-east from Croydon is Normanton - once the port for Croydon gold rush, and still the busiest town in the Gulf Savannah region. The most famous buildingis of course the Purple Pub, but Albion Hotel and the Central are nice too. Other pretty buildings include the Shire Council, Westpac Bank, the Burns Philp & Co Ltd which is where the library is today, and there is also an amount of colourfully painted tackle shops, butcheries, fuel and car mechanic shops. 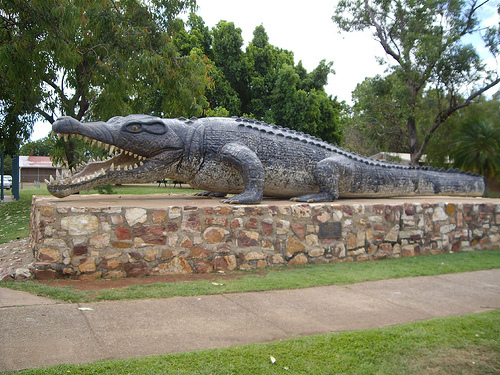 Normanton has also got two of Australia’s Big Things: the Big Barramundi and Krys the Big Crocodile - a replica of an eight metres saltie found in the Gulf Savannah region, the largest ever shot in Australia. You can stay at the pubs, at the Gulfland Motel, and in Normanton Caravan Park. North of Normanton, right on the shore of the Gulf Savannah, is Karumba – a town mostly known for its excellent fishing. Its permanent population of 500 triples in the Dry Season (southern winter), when a lot of people come here to fish; and the town itself is kept alive by fishing and prawning industries. An interesting place to visit is the Barramundi Discovery Centre that continuously restocks the waters with barramundi fish. Karumba is also famous for its beautiful sunsets, best enjoyed from the Sunset Tavern in Karumba Point. Most tourists head here, while the locals and fishermen are more likely to be found in the famous Animal Bar. In Karumba, you can stay at Gulf Country Van Park and Ash’s Holiday Units, and at the Karumba Point there are the Sunset Caravan Park, End of the Road Motel and Karumba Point Tourist and Caravan Park. West of Normanton and Karumba is Burketown, in the middle of Gulf Savannah's flat saltplains. 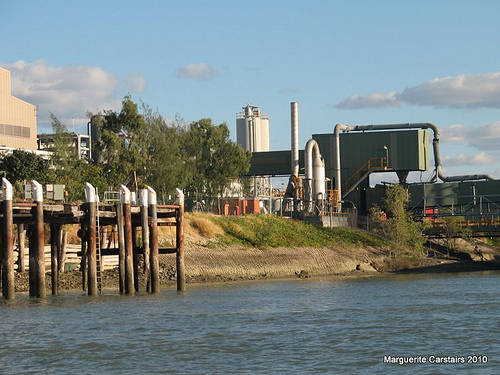 Burketown is actually not on the Gulf Savannah but in the mouth of Albert River about 30km away from the ocean waters. It was founded in 1865, but yellow fever wiped out the most of the towns's population only shortly after. 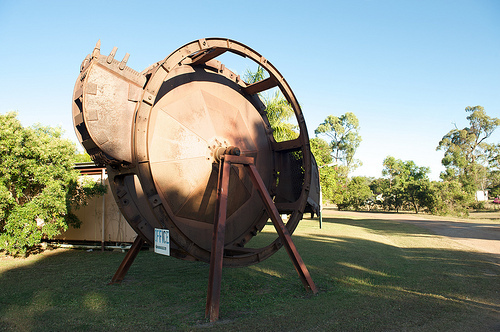 Just above the high tide level, Burketown is often cut off the rest of Australia during the wet season and in 1887 the town was devastated by a tidal surge. Today it is the centre of the vast cattle country of the Gulf Savannah region and famous for its “Morning Glory” cloud formations that can be seen between September and November. In the town, there is a colourful artesian bore, an interesting cemetery, and a good old pub. 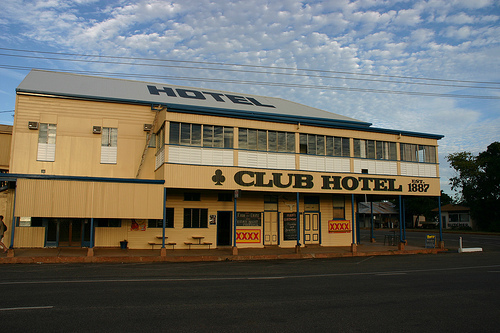 You can stay at the Burketown Pub or Burketown Caravan Park. South of Burketown is the remote but beautiful Lawn Hill National Park - one of the real gems of the Gulf Savannah region. It has got a beautiful gorge surrounded by red rock walls, and there are 25km of bushwalks to lookout points. 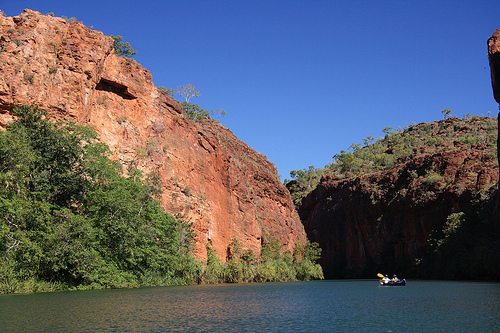 You can rent a kayak to discover the gorge, which has been carved into ancient sandstone and surrounded by pandanus and cabbage palms. There is camping in the national park, but other than that, a popular place to stay is Adels Grove just outside the park. Here's an Australian outback map showing the Gulf Savannah Region, where I have tagged the places that I mentioned on this web page. You can click on the tags to see what places they are, and double-click anywhere on the map to zoom it in and see the places closer. Drag the map to move around, and if you want to see the satellite image with Google Earth, click on "Sat" in the top right hand corner. Did you go to Gulf Savannah? 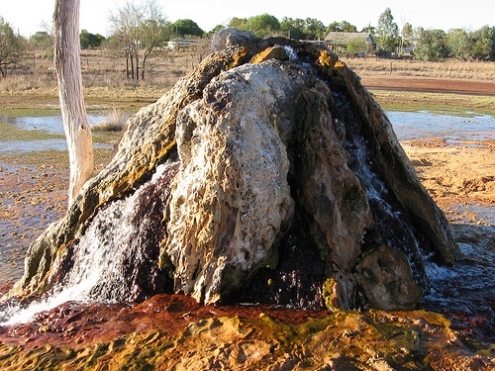 Went to the Gulf in 2006, Karumba, Normanton, Burketown, Lawn Hill NP. Great places - and great fishing! !